Non-centrosymmetric (NCS) materials, those that do not contain an inversion center, exhibit a variety of important functional properties. These include, ferroelectricity, pyroelectricity, piezoelectricity, and second-harmonic generation. A Venn diagram depicting the relationships between acentric crystal class and physical property is shown below. Our interest is in not only discovering new NCS materials, but also understanding their structure-property relationships. We have focused on synthesizing new NCS materials by utilizing cations susceptible to second-order Jahn-Teller (SOJT) distortions, i.e. octahedrally coordinated d0 transition metals (Ti4+, Nb5+, W6+, etc. ), and cations with a stereo-active lone-pair (Sn2+, Se4+, Te4+, etc.). In doing so, we have synthesized and characterized a variety of new NCS compounds. More recently, we are focusing on NCS materials with deep UV NLO applications, i.e., where the absorption edge is less than 200nm. We have an ongoing collaboration with Prof. James Rondinelli (Northwestern University - http://mtd.mccormick.northwestern.edu/) to investigate the atomic distortions in these materials. Yu, H., Young, J., Wu, H., Zhang, W., Rondinelli, J.M., and Halasyamani, P.S., M4Mg4(P2O7)3 (M = K, Rb): Structural Engineering of Pyrophosphates for NLO Applications, Chem. Mater., Chem. Mater., 29, 1845-1855, 2017. Yu, H., Zhang, W., Young, J., Rondinelli, J.M., and Halasyamani, P.S., Design and Synthesis of the Beryllium-Free Deep-Ultraviolet Nonlinear Optical Material Ba3(ZnB5O10)PO4, Adv. Mater., 27, 7380-7385, 2015. Yu, H., Wu, H., Jing, Q., Yang, Z., Halasyamani, P.S., and Pan, S., Polar Polymorphism: a-, b-, and g- Pb2Ba4Zn4B14O31 - Synthesis, Characterization, and Nonlinear Optical Properties, Chem. Mater., 27, 4779-4788, 2015. 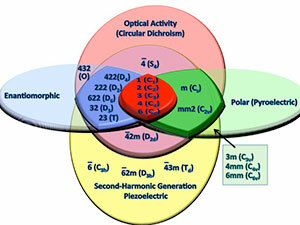 Cammarata, A., Zhang, W., Halasyamani, P.S., and Rondinelli, J., Microscopic Origins of Optical Second Harmonic Generation in Noncentrosymmetric-Nonpolar Materials, Chem. Mater., 26, 5773-5781, 2014. Thao, T.T., Halasyamani, P.S., and Rondinelli, J., Role of Acentric Displacements on the Crystal Structure and Second-Harmonic Generating Properties of RbPbCO3F and CsPbCO3F, Inorg. Chem., 53, 6241-6251, 2014. Nguyen, S. D. and Halasyamani, P.S., Synthesis, Structure, and Characterization of Two New Polar Sodium Tungsten Selenites: Na2(WO3)3(SeO3). 2H2O and Na6(W6O19)(SeO3)2, Inorg. Chem., 52, 2637-2647, 2013. Tran, Thao T. and Halasyamani, P.S., New Fluoride Carbonates: Centrosymmetric KPb2(CO3)2F and Noncentrosymmetric K2.70Pb5.15(CO3)5F3, Inorg. Chem., 52, 2466-2473, 2013. Nguyen, S.D. and Halasyamani, P.S., Synthesis, Structures, and Characterization of New Noncentrosymmetric and Polar Li6(Mo2O5)3(SeO3) and Centrosymmetric Li2(MO3)(TeO3) (M = Mo6+ or W6+), Inorg. Chem., 51, 9529–9538, 2012. Yeon, J., Kim, S.-H., Nguyen, S.D., Lee, H., and Halasyamani, P.S., Two New Noncentrosymmetric (NCS) Polar Oxides: Syntheses, Characterization, and Structure-Property Relationships in BaMTe2O7 (M = Mg2+ or Zn2+), Inorg. Chem., 51, 2662-2668, 2012. Yeon, J., Kim, S.-H., Nguyen, S., Lee, H., Halasyamani, P.S., New Vanadium Selenites: Centrosymmetric Ca2(VO2)2(SeO3)3(H2O)2, Sr2(VO2)2(SeO3)3, and Ba(V2O5)(SeO3), and Noncentrosymmetric and Polar A4(VO2)2(SeO3)4(Se2O5) (A = Sr2+ or Pb2+), Inorg. Chem., 51, 609-619, 2012. Nguyen, S. D., Yeon, J., Kim, S.-H., and Halasyamani, P. S., BiO(IO3): A New Polar Oxide Material, with a Large SHG Response, that contains Two Lone-pair Cations and Exhibits an Aurivillius-type (Bi2O2)2+ Layer, J. Am. Chem. Soc., 133, 12422-12425, 2011. Nguyen, S.D., Kim, S.-H., and Halasyamani, P.S., Synthesis, Characterization, and Structure-Property Relationships in Two New Polar Oxides: Zn2(MoO4)(SeO3) and Zn2(MoO4)(TeO3), Inorg. Chem., 50, 5215–5222, 2011. Yeon, J., Kim, S.-H., and Halasyamani, P.S., A3V5O14 (A = K+, Rb+, or Tl+): New Polar Oxides with a Tetragonal Tungsten Bronze Related Structural Topology – Synthesis, Structure, and Functional Properties, Inorg. Chem., 49, 6986–6993, 2010.